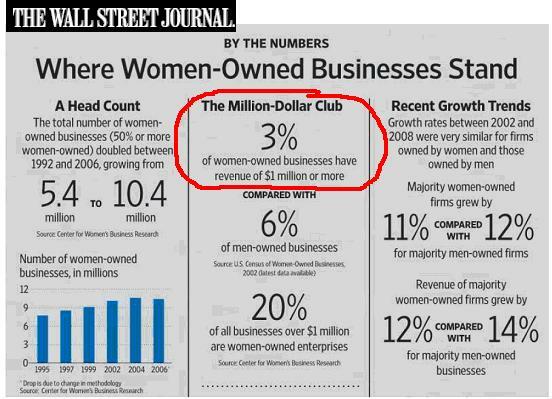 So, it is dismaying to see that, despite all this progress, on average, women-owned business are still small compared with businesses owned by men. And while the gap has narrowed, as of 2008—the latest year for which numbers are available—the average revenues of majority women-owned businesses were still only 27% of the average of majority men-owned businesses. While the number of women starting their own business outpaces men, revenue for female owned companies still lags behind. Hear Sharon Hadary, Former Executive Director and Founder of the Center for Women’s Business Research, discuss this trend and what women can do to improve their prospects. There are those who will say that these numbers substantiate what they always knew: Women just don’t have what it takes to start and run a substantial, growing business. But I don’t buy that: More than a quarter of a million women in the U.S. own and lead businesses with annual revenue topping $1 million—and many of these businesses are multimillion-dollar enterprises. Clearly, many women have the vision, capacity and perseverance to build thriving companies. So what’s holding back so many women business owners?